The seeds of Hip Hop were first sown during the early 70’s by DJs such as ‘Cool Herc’ in the Bronx, U.S.A.
DJs would play parties with twin turntables and soon realised that by using two copies of the same record they could prolong their favorite breakdowns to the further enjoyment of the crowd. Over these extended breakdowns MCs could tell or ‘rap’ stories along to the beat, whether it be about a woman they liked or about what they had for breakfast, it all added to the effect of the records and sometimes added a touch of light hearted entertainment in an otherwise difficult ghetto life. Eventually the DJs started making their own records to rap over. By using Roland drum machines and electronic synthesizers that could be synchronized together, a new sound called ‘Electro Hip Hop’ was formed. This music craze was accompanied by another new art form.. Spraycan Art or “Graffiti Art” which also originated in the Bronx but quickly spread across America and eventually Europe and the world. Gradually a new way of dancing accompanied Hip Hop and Electro, it took wild moves from Jazz and other street dance forms and became known as ‘break dancing’. Breakers would form crews and use linoleum sheets or card to battle each other, sometimes in front of passers by. 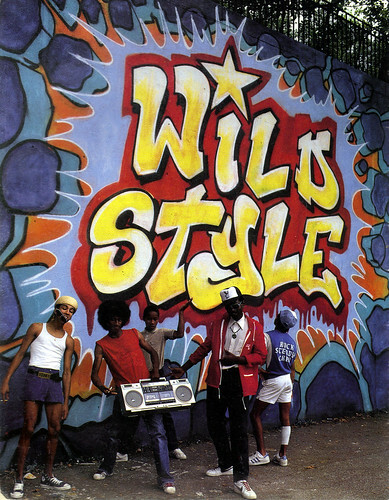 The fashion was also important, b-boys would wear designer sports labels such as Nike, Puma, Adidas, Fila and Elise.. from head bands to trainers and caps to shell tracksuits. The popularity of the sampler allowed hip hop producers to sample old funk and soul records to further experiment with break beats. By the late 90’s Hip Hop was reaching it’s zenith and artists such as BDP, Mantronix, Eric B & Rakim and De La Soul were finding great popularity. Even white punk and rock bands tried getting in on the act with artists such as Aerosmith and The Beastie Boys getting “DEF” and kids normally into heavy metal started wearing lace-less shell toe adidas trainers. Hip Hop has since remained popular in two forms, on a commercial level which is more commonly associated with R&B and MTV but also it carries on in a more underground fashion with sub genres like grime, garage and bhangra. Hip Hop will always be around thanks to a rich heritage laid down by such luminaries as Afrika Bambaataa and The Soul Sonic Force, hip hop continues to evolve.